This linen/tencel blend that I found at Material Girls is absolutely dreamy and gets softer and softer each time it washes. It’s not really wrinkly, just wobbles up in that nice washed-linen kind of way. And of course I put it in the dryer, so let’s hope I preshrunk it enough. The facing fabric is from the Tailor Made line from Cosmo Cricket for Andover (which I got at Whipstitch, looks like she still has it). not sure what’s up with the kitchen timer. guess the boy likes a good prop to fiddle with. If you’ve been around here for awhile you know that I’m crazy about tunics with the facings on the outside. First there was the Octotunic, then there were the swim coverups, and then this little whale pj top. 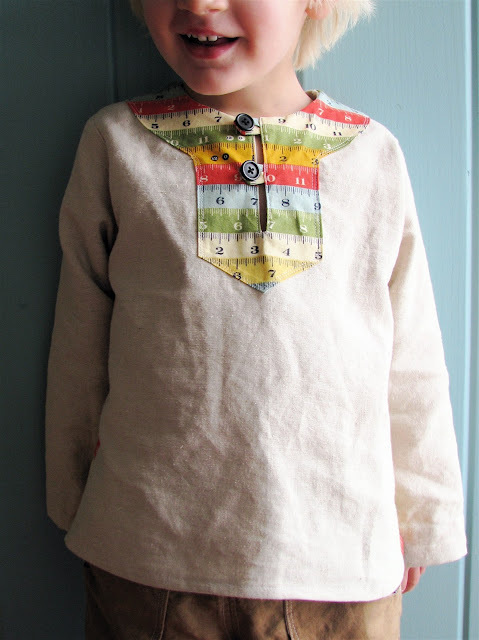 This top is basically the whale pattern adapted for woven fabrics (which in a nutshell means widening the armholes and pushing out the sides a bit so you can get it over their big little heads without too much trouble). The cuffs fold up, or not, and I dig the decorative facings on the side vents. 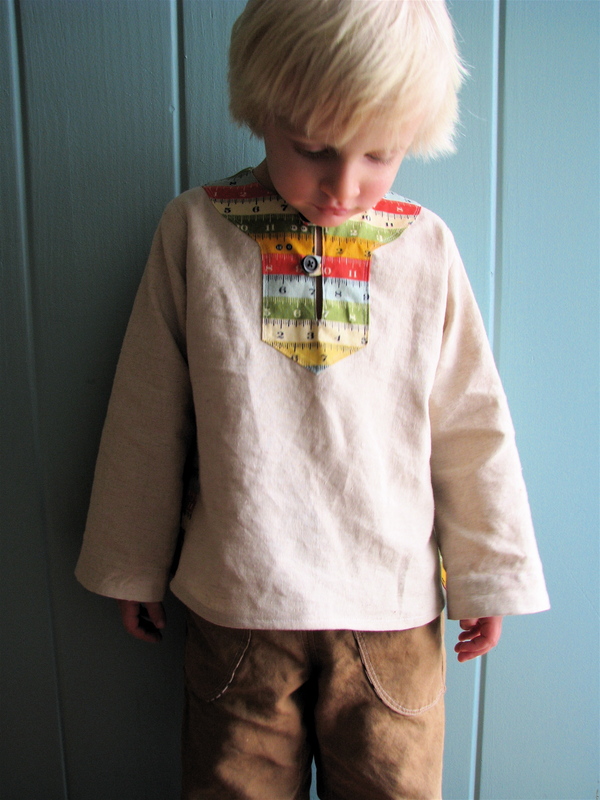 I’m calling this the “Charlie tunic” because I think he looks like Charlie of Charlie and Lola in it. And hope you like it, because guess what, I made two more! What can I say, when I’m on a roll, I’m on a roll. Pictures of the others will be forthcoming. Do you like it? It looks fantastic! Is there a pattern available? Would love to make one for my boys…and me…looks SO comfy. You know I love it. LOVE it. What an EXCELLENT use of that fabric! I love this. Love this! The design and the fabrics you chose! I LOVE this! That fabric around the neck is wonderful! NOt fair to post with out a pattern…:-(. This is one of the best shirts I have seen for a boy that is a bit different than tees and button downs. I love it! I'm not as much into the tunic as you are, but this could change my mind! I love the placket, Rae. I might have to try one of these! I'm in love with that placket. And I didn't comment before, but those pants are really wonderful. I need to grab that pattern and make a few pair. i LOVE it, especially the name – I think I need to make my little Charlie one ASAP! Clever, happy and boyish! And your model makes everything look good! I love this! And I have linen AND that very fabric… I would love a pattern! I think it is so sweet. I love the facing fabric. Love it! I want one. okay – now to find the fabric and the time! Almost a European look? So classic, I love it 🙂 I would never know what to do with the fun prints you find (rulers??!) but you do such great things! It's beautiful Rae! I often feel a little bummed that there are so few top options for boys (you are right, it's pretty much shirt, t-shirt or hoodie), but this is great! Please please please give us a tutorial! 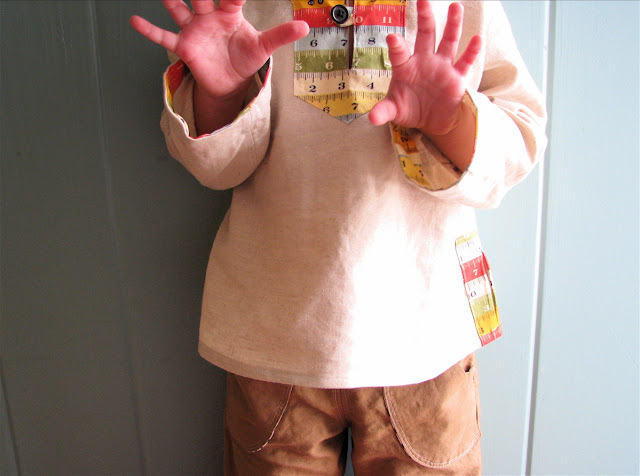 I just love this shirt for boys! I am going to jump on the "You need to share a pattern!" bandwagon!!!! I LOVE this shirt! 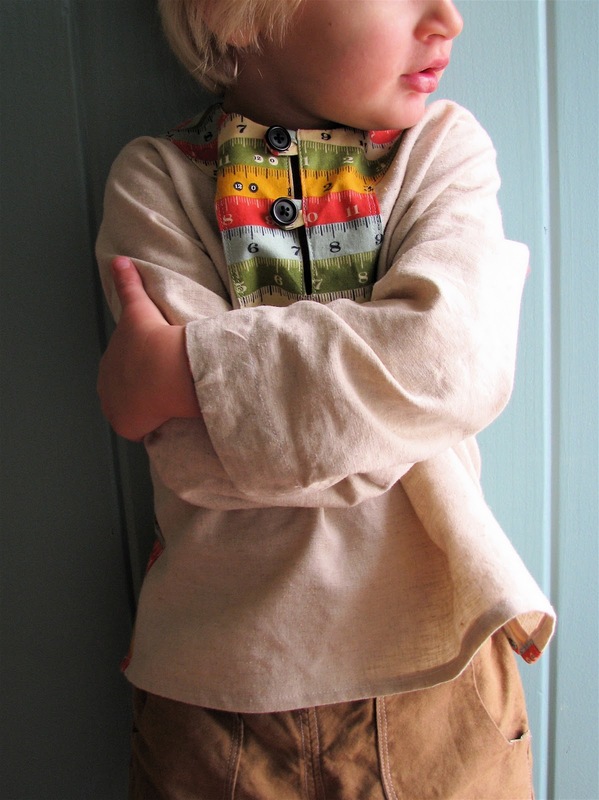 Now THIS is a boy shirt, a great shirt, a shirt that evokes timeless, ethnic, and darling without being one bit girlie. Fantastic! love d fabby looks fantastic..
Adorable! Looks like a great transition into summer piece. FABULOUS! 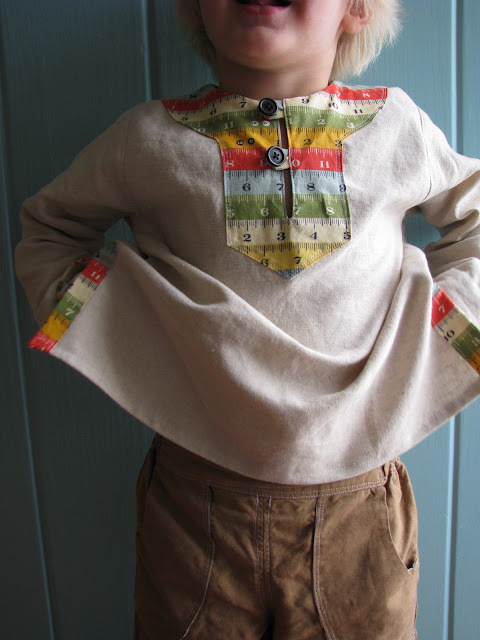 I'm hoping you'll post a tutorial on making the shirt… my little boy, and girls need shirts like that! LOVE the pants too. Why aren't you my neighbor?! Well, it looks such a fantastic and too much beautiful. It is very nice pattern. Rae, thank you so much for the inspiration. I'm going to make my own version, now I've seen this one. It's so hard to find tunics for boys, even here in Europe (the Netherlands). Luckely I have enough sewing experience now to translate a shirt pattern into this kind of wear. 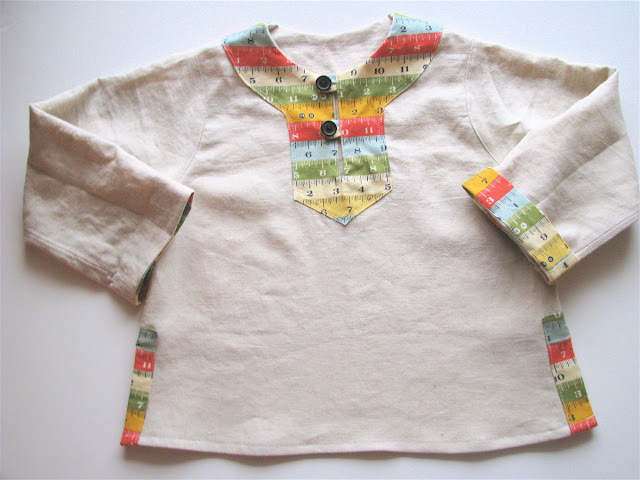 And those plackets! What a great touch. Oh… all those fabrics I have and can use for them. Ever since I saw you picture I'm dreaming about it. Thanks!!!! I love it! And the fabrics? Soooo cute! That is exactly what I've been looking for for my DS. Is there a pattern somewhere that I'm missing? omg he DOES look like Charlie! ahahaha cuuuute. LOVE this shirt. I was checking every link to see if there was a hint about a pattern or measurements. *pouty* This will be a good challenge. Thanks for the inspiration! Been looking for something classic and easy wearing for my boys, this is perfection!!! Hi friends! So I hate to make promises about patterns on the blog because I tend to be very slow when it comes to producing (something about being a mom?!? ), but I have been working on this as a pattern…Anyway, stay tuned, currently I have sizes 12 months -5T in the works. I love it- I can't wait for the pattern! Like lots of others here, I can hardly wait to get the pattern. 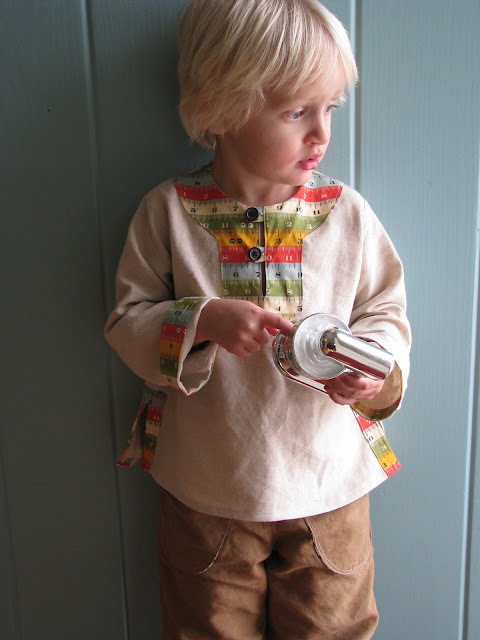 I'm a grandma with grandboys, just not near by so I can't measure and mess around to make my own pattern. I'm depending on you, Rae, to come through for me. I would also LOVE to see a pattern! I love this shirt. I can not wait for the pattern to make it for my little boy and girl! Like everyone else – hope to see the pattern soon!